Need for Speed: High Stakes, released in Japan as Over Drivin' IV, released in Europe and Brazil as Need for Speed: Road Challenge, released in Germany as Need for Speed: Brennender Asphalt, and released in France as Conduite en etat de liberte, is the fourth game in the Need for Speed series. It once again features a host of exotic cars and tracks located in Western Europe and North America. It is notable in the Need for Speed franchise for the first installment to include a damage model and a career mode where the player earns money by winning races and can spend it on more cars, upgrades, or repairs. There is also Classics, DICE, and Sold Out versions of Need for Speed: Road Challenge for Windows and a Platinum version of Need for Speed: Road Challenge for the PlayStation. Need for Speed: High Stakes introduction sequence. 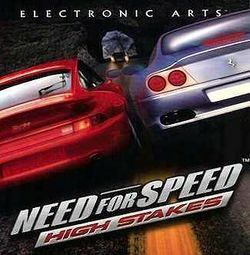 Need for Speed: High Stakes is an arcadier title compared to Hot Pursuit. Cars can make sudden swerves and brakes are usually not needed. The game also features higher jumps than seen in Hot Pursuit. High Stakes is the first Need for Speed game to include damage, which can affect the performance and appearance of cars after an impact with a wall, object, or other cars. Three game modes with each having their own objectives and rewards are featured in this title. Career Mode - Career play is the only mode in the game that uses money. Cars must be purchased and repaired using the money won from races. The game progresses through a series of tours with each containing several tournaments, knockouts, and a High Stakes race. Money is awarded to the contestants at the end of each event with the higher your position the more money you earn. Hot Pursuit - This mode allows the player to attempt to escape from the police while racing an opponent, or to stop players in police cars. Cops can use roadblocks and spike belts. Human players also have the chance to drive Al police cars. Single Race - The single race mode is a fully customizable race mode, where players are allowed to choose the track, the car, number of opponents, and driver aids. There are no rewards in this mode. Unlike Windows players, PSX players can use upgraded cars from Career Mode in Special Events Mode and in tournaments. High Stakes - Every tour in Career Mode ends with a High Stakes race. A High Stakes race consists of two opponents only. The winner of the race is given the loser's car instead of a cash prize. Knockout - Knockouts consist of several races against a full grid of opponents of the same class of cars as you. The last opponent at the end of each race is eliminated from the knockout. The last player standing is the winner. The bonus mechanism is similar to the Tournament, the player is awarded with one or more tracks depending on the difficulty. Special Events (PSX only) - Special Events are like Tournaments and consists of several races against a full grid of opponents of the same class as the player. Players are awarded points, the higher a player places the more points he/she earns. Some Special Events are races that allow cars from any class to enter the race while others only allow a upgraded version of a car that can be entered into an event. The person with the most points and is in the lead is the winner. Pro Cups - There are three Pro Cups that are unlocked in the progression of the game. Each Pro Cup os limited to one specific manufacturer. The tournament features three bonus tracks: Raceway, Raceway 2, and Raceway 3. The first place winner is awarded the bonus car that corresponds to the class that the Pro Cup is specific to. Test Drive (PSX only) - Test Drive allows players to select a car and take it out for a drive on tracks. This is also the only mode that the police helicopter that is unlocked in Hot Pursuit mode can be used in. Tournament - Tournaments consist of several races against a full grid of opponents of the same class of cars as the car your driving and players are awarded points for completing each race. The better position a player places, the more points he/she gets. The person with the most points at the end of the tournament is the winner. The winner is awarded with one or more bonus cars depending on the difficulty of the tournament (for example: on Champion difficulty, the player gets all three of the bonus cars). By completing a tournament, PSX players will unlock the Special Events Mode. High Stakes is the first game in the series to allow visual modifications to cars. These mods are only purchasable in Career Mode. It's only possible to buy packages, which include spoilers, vinyls, and new rims. Visual mods are only purchasable in packages, which contain performance modifications as well. Parts cannot be bought individually. Fine-tuning is still possible to perform in High Stakes. The new performance upgrading mechanism also allows players to keep up and compete with higher classed vehicles. The Platinum version has a platinum/silver band on the games casing and the original disc design is replaced with a simple silver design with copyright notices along the edges and the games name in the centre surrounded by a black outline. This is just a distinction that a game receives after it has reached over 400,000 sales after generally one year on the market for all PlayStation game consoles. However, if a game reaches over 400,000 sales, it does not neccessarily qualify for a Platinum title. This page was last edited on 30 May 2016, at 13:30.